DeVere chemists are on the leading edge of cleaning and sanitizing technology. DeVere has patented and other high-technology solutions to meet all the HACCP food safety and sanitation needs of food processing facilities. DeVere products help clean and sanitize hundreds of food processing areas providing the DeVere sales and service team the experience they can use to solve any cleaning problem. DeVere uses its 60+ years of chemical manufacturing experience to optimize supply chains offering the best value in concentrated, cross-functional products. DeVere has products to meet every cleaning and sanitizing chemical need within food production facilities. DeVere works with facilities to optimize cleaning in all areas of the business including processing, storage, kitchens, offices, restrooms, laundry areas, and locker rooms. DeVere offers product use, safety, and general sanitation training. In addition to chemical products, DeVere supplies and services a wide variety of dilution and dispensing options. DeVere manufactures a complete line of food plant cleaners and sanitizers. From entryway control to food-contact surface cleaning to restroom cleaning to plant cleaning to common area cleaning, DeVere has every chemical product the modern food production facility needs. When your facility requires you to follow HACCP food safety requirements and comply with FSMA, trust DeVere Company to help. This patented, quat-free, OMRI-certified organic product is the first granular floor treatment that combines alkalinity and multiple oxidizing compounds for superior performance. When activated, this product generates hydrogen peroxide and a small amount of chlorine to accelerate activity. 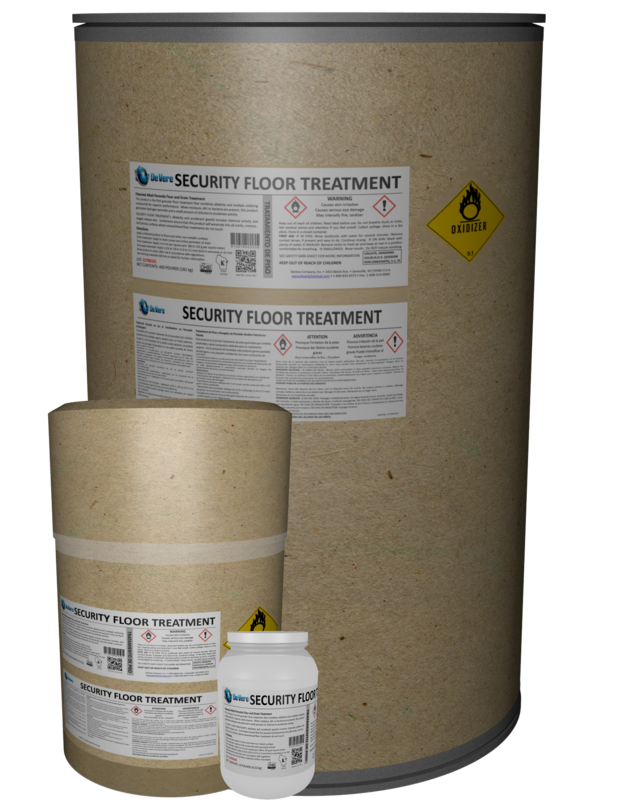 Security Floor Treatment’s alkalinity and accelerant greatly increase chemical activity and oxygen-release rate. Surfactants ensure that this product will penetrate into all cracks, crevices, and porous surfaces where conventional products do not touch. All significant components in this product are biodegradable. This quat-free EPA-registered products sanitizes entryways, drains, and floors. See the product page for a list of organisms and more information on the only quat-free dry floor sanitizer. This concentrated, powder, moderate-foam degreasing alkaline detergent will dissolve in grease or in water. Sprinkle this product on grease to emulsify the grease to make it easy to rinse-away. Dissolve this product in water to make a powerful degreaser and floor cleaner. This concentrated, premium, chlorinated, low foam, built alkaline detergent works best in high-temperature clean-in-place applications. It is strong enough to handle the most difficult soils and cleaning applications. Use Chlor CIP in food production areas and other stainless steel pipeline systems. 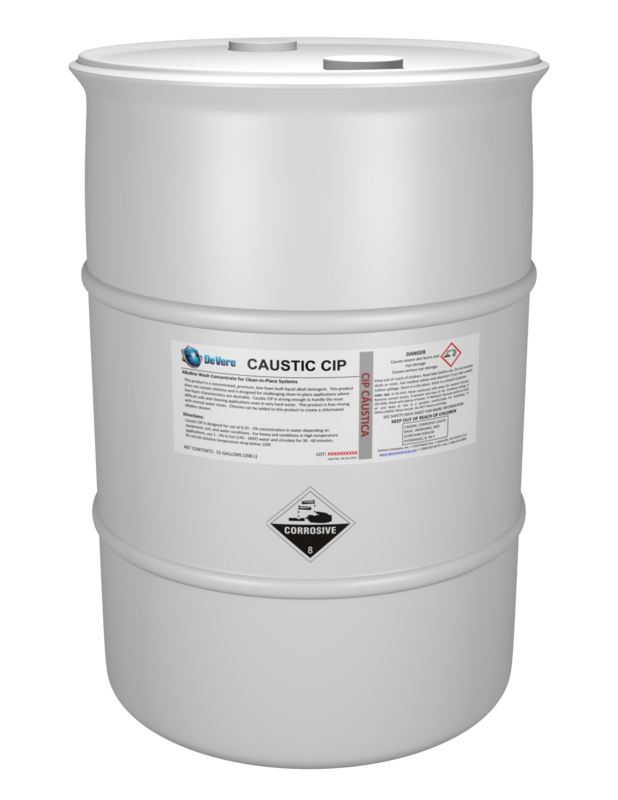 CAUSTIC CIP is a concentrated, premium, low foam, built alkaline detergent. This product does not contain chlorine and is designed for challenging clean-in-place applications where low-foam characteristics are desirable. Caustic CIP is strong enough to handle the most difficult soils and cleaning applications in very hard or soft water. This product is free-rinsing with normal water rinses. Add Sanitizer Concentrate to this product to create a chlorinated alkaline cleaner. CHLOR FOAM is a concentrated, premium, chlorinated, high foam, built alkaline detergent. It is designed for challenging foam and manual cleaning applications where high foam characteristics are desirable. Chlor Foam does not contain any nonylphenol ethoxylates (NPEs). It is better for the environment and is subject to fewer regulatory restrictions than similar NPE-containing products. It will work in hard or soft water. CAUSTIC FOAM is a concentrated, premium, high foam, built alkaline detergent and does not contain chlorine. It is designed for challenging foam and manual cleaning applications where high foam characteristics are desirable. Caustic Foam does not contain any nonylphenol ethoxylates (NPEs). It is better for the environment and is subject to fewer regulatory restrictions than similar NPE-containing products. ACID FOAM is a concentrated, premium, phosphoric acid-based foaming cleaner. It is designed for foam and manual cleaning all types of processing equipment in the dairy and food processing industries. Acid Foam does not contain any nonylphenol ethoxylates (NPEs). It is better for the environment and is subject to fewer regulatory restrictions than similar NPE-containing products. ACID FOAM NP is a concentrated, acidic, premium foaming cleaner that does not contain phosphoric acid or phosphates. Acid Foam NP does not contain any nonylphenol ethoxylates (NPEs). It is better for the environment and is subject to fewer regulatory restrictions than similar phosphate and NPE-containing products. OXY CONCENTRATE is a concentrated, stabilized hydrogen peroxide solution with a unique blend of wetting agents and rinse aids which is used as the powerful bleaching base for alkali-peroxide cleaning systems. Oxy Concentrate provides the hydrogen peroxide component for CIP/COP/Foam applications taking the place of chlorine in chlorinated caustics. When combined with DeVere’s Caustic Foam and Caustic CIP it provides the best non-chlorine cleaning program available. SPECIAL CLEANER is a concentrated butyl-based detergent for hard surface cleaning applications. Special Cleaner is a heavy-duty, all purpose cleaning concentrate specially formulated for difficult cleaning jobs. This product cleans the toughest soils on hard surfaces and acts as a great degreaser. WOW is a concentrated alkaline detergent for hard surface cleaning applications. One of the strongest yet safest detergents made. This is also the ideal cleaner for all types of floors – removes black heel marks. This product is a new, Green Seal-registered, all-purpose, peroxide-based cleaner. Use this one product to clean break rooms, office areas, and bathrooms. QDII Sanitizer is newer technology and is a better cleaner and germicide. It is a quat-based sanitizer specifically formulated for food processing applications. This product is a disinfectant, sanitizer, deodorizer, mildew-stat, and virucide designed for use in hospitals, nursing homes, the home, hotels, institutional, industrial, schools, dairy, restaurant, food handling and processing areas, Federally inspected meat and poultry plants, and institutional kitchen use. This product is EPA registered as a food-contact sanitizer as well as a general-purpose hard and soft surface sanitizer. Whether you need meat plant sanitation or food plant sanitation, DeVere has you covered. SANITIZER CONCENTRATE is a concentrated sanitizer and de-stainer for all sanitizing applications in the food, dairy and beverage industries. Twice as concentrated as household bleach so that it sanitizes and removes stains.